A Dinghy Sailing tagged image from photographer – johntrathome as published on Flickr. 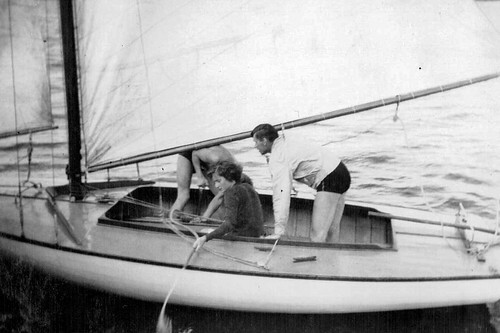 "Malcolm – behind the sail. Janet and Eddie, baling out the Point Claire after a roughish trip. The P.C. is somewhat larger than the Nationals". All photographs taken by my father, Gerald Trevor Roberts, in August 1942 during leave from the RAF in Nova Scotia. Sailing on it, Rowing on it, but Swimming in it?